The following content is being shared in partnership with the Nestlé Purina PetCare Company. All thoughts contained below are original and property of Momma Told Me Blog 2017. Did you know June is National Pet Preparedness month? More than half of U.S. homes have a prepared emergency evacuation kit in their home but most do not have a plan in place for their own family pet. Having a pet, or multiple pets, in your home is much like having a child during an emergency. Unfortunately, while you can educate and practice escape routes and procedures with your children (especially as they grow) pets cannot benefit from the typical preparedness of such verbal skills. However, they can benefit from some advanced planning on your part, a little extra care and attention to emergency kits, and even from mock drills. I recently had the chance to attend a YouTube live session with Dr. Kurt Venator, Purina Veterinarian, and pick his brain on safe practices, and what to expect, during an emergency with pets. -When it comes to water for your pets the general rule of thumb is to reserve 1 gallon of water for every 3 days for cats and dogs, compared to 1 gallon a day for humans. 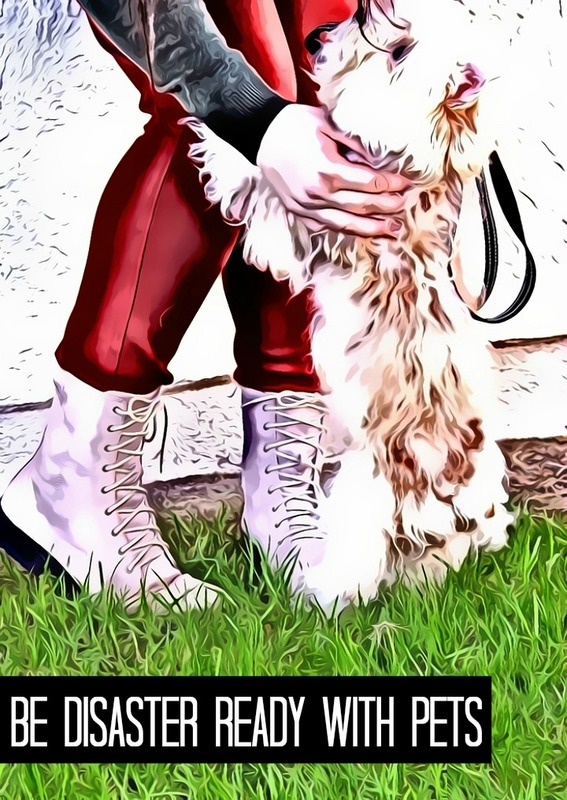 However you will want to research exact quantities for larger breed dogs, elderly pets, and medical issues, as they pertain to your family's exact furry composition. 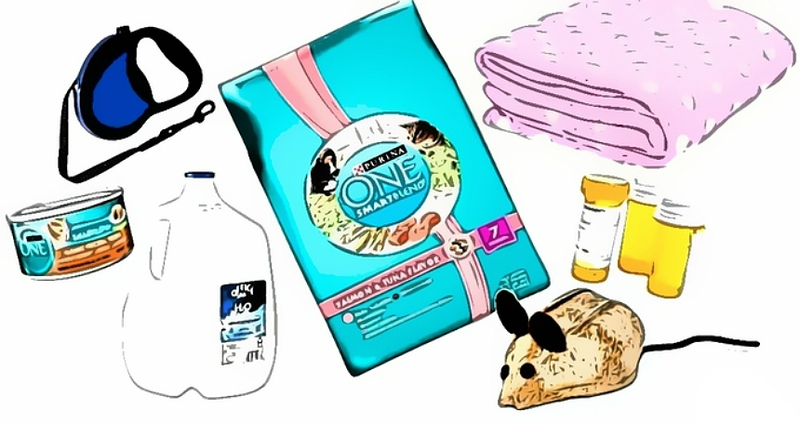 -Always date pet food when stocking your family's emergency kit. Canned, or 'wet' food will keep longer than dry food and be less susceptible to spoil should they come in contact with water (say, in a flood.) Switch out the food in your pet's emergency supply every 6 months, or as needed by date for canned foods. -Include a nylon leash and harness for your dog- you may not be able to, or thinking to, grab your pet's leashes and gear during an emergency. Keep a separate set inside your emergency kit just for this. -Be sure to include any pet medications, enough for 5 days to a week. Your veterinarian should be able to write and fill an emergency prescription for this purpose, in advance. Be sure to put all pet medications in a bag that is clearly marked with the pet's name, dosing instructions, your contact information, and your vet's contact information. You never know if a neighbor, or first responder may be the one to initially handle your pet in an emergency. -Store your supplies inside a hard shelled carrier with your pet's name and your contact information written in waterproof marker. If your pet is too large for a carrier a large seal-top bucket will often do. Don't forget to pick up an emergency litter pan for the cats- they make disposable ones that are intended for temporary use which work perfect in a pinch. "Being able to help your pets transition and move in an emergency situation is really important." Naturally the size, age, health, and temperament of your pet/s all play a big role in how well you will be able to effectively evacuate in an emergency. You will likely panicked, and animals are great at picking up on their owner's emotions. Remaining calm is the first key to keeping your pets calm and cooperative. Keep small cats and dogs in their hard-shelled emergency kennel at all times while moving. Cutting a slot in the top of an old blanket so you can toss it over the crate and still carry your pet may help with some of the anxiety and confusion for your pet. For larger dogs, you are unable to carry, always use a harness to avoid choking scared and disoriented pets. Make sure their ID is attached not just to a collar, but the harness as well. The more identification on your pet in an emergency, the better. Elderly pets may be less mobile and require assistance in and out of buildings or cars. You can use an old sheet or blanket ran under your dog's hind quarters with a light lifting motion to help ease some of the weight off of dogs with joint and back problems. It's even better to have a lightweight ramp on hand. Naturally knowing the types of disasters that are local to your area will help you best prepare for how to handle them. Natural disasters are just one form of an emergency to prepare for but you should always consider the potential for fires, terrorist attacks, and more. Talk to your personal veterinarian about local disaster preparation and identify pet surrender facilities, emergency veterinarian contacts, and any special things you may need to watch out for specific to your breed or pet. If your pet is prone to panic attacks or high anxiety consider asking for an anxiety medication you can put in your emergency kit- just be sure to try the tranquilizer with your pet prior to an actual emergency so you can know exactly what to expect. In many cases micro-chipped pets will alert the veterinarian on file if found separate from their owner. Ensure that your microchip information is up to date annually and add an emergency contact (such as a friend or neighbor) to your personal contact list directly with your veterinarian. 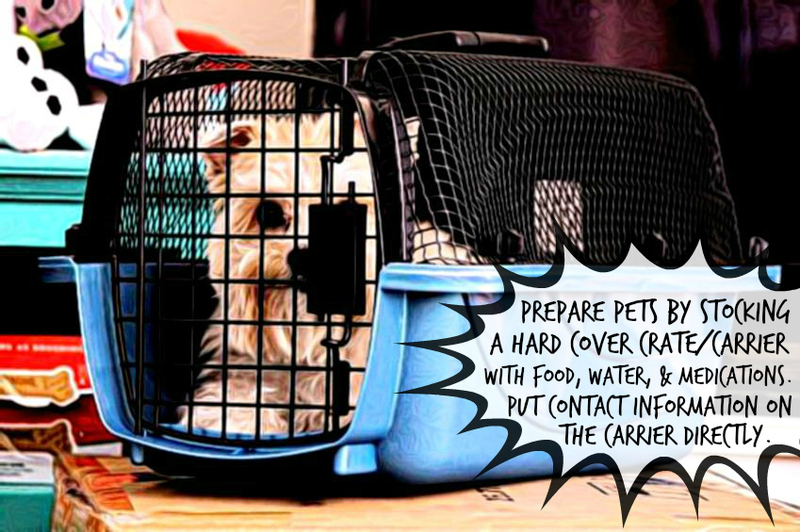 One of my personal favorite pet preparedness tips applies to human safety as well- in an emergency do not rely on electronic communication, records, or maps. 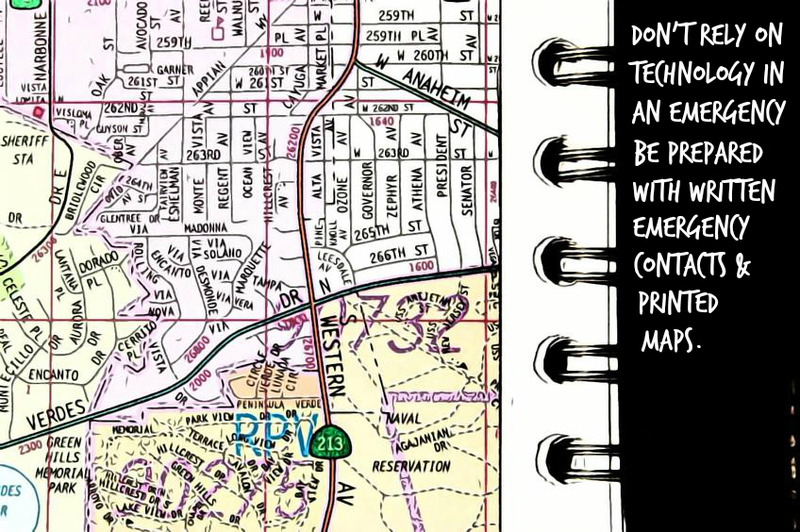 Make sure to keep a local map in your emergency kit, sealed in a waterproof bag. Write ON the map your pet's emergency contact and veterinary info, as well as points of interest such as shelter and surrender points. Again, and I cannot stress this enough, make sure everything attached to your pet is clearly identified with contact information. While you may have a microchip do not rely on it to reunite you and your pet. It may be some time before your bet would wind up at a facility able to scan the chip and that's precious time in a disaster. Furthermore, add your emergency contact, when possible, as you may not always have a method of contact in the event of a disaster. One of the things many of the participants of our YouTube chat felt strongly about was how to prepare for the event that pet and owner would be separated during an emergency. Dr. Kurt Venator was quick to urge that not only pets wear and have several forms of emergency identification, but your home should as well. As scary as it may sound you may not always be home with your pets when disaster strikes. 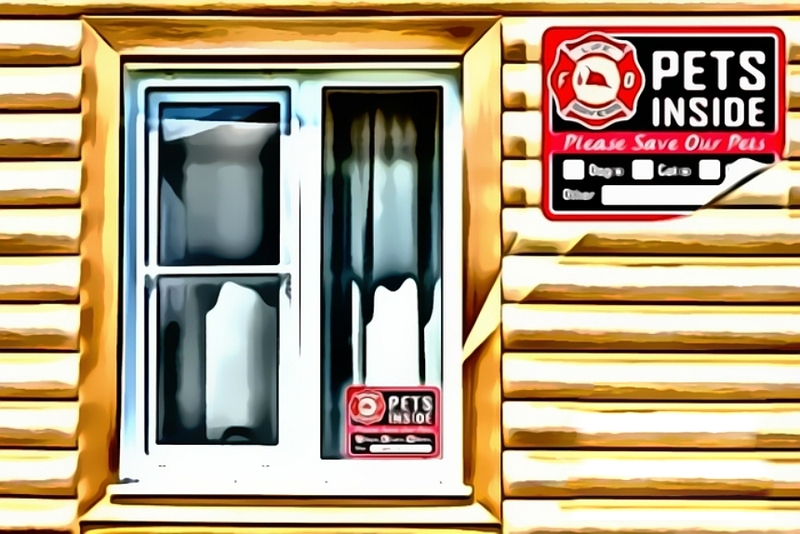 The ASPCA, your local veterinarian, pet supply stores, and more carry a variety of Emergency Alert decals to notify first-responders of your pet's presence. Display this decals in multiple windows around your home and be sure to check them regularly for fading and legibility. Lastly, DO get your pets involved in your family's disaster preparation. While your pets may be unable to speak for themselves they CAN benefit from simple practices such as acclimating them to emergency carriers and harnesses. Involve every member of the family with not only building your pet's emergency kit but the evacuation plan and any special care/handling your pet may need to get them ready to go in an emergency. And remember, if your plan involves using a sedative for transport- do a trail run prior to an actual event so you know how your pet will react! Naturally nobody can ever be truly prepared for a disaster but many of these steps can help you and your pet feel more calm and prepared should one hit. 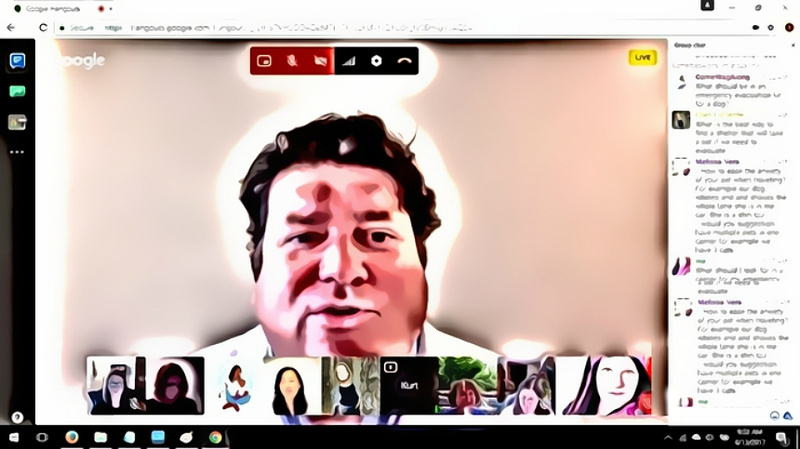 I really enjoyed picking Dr. Kurt Venator's brain during the YouTube live session and I'm especially excited to share yet another informative Purina event coming later this month. 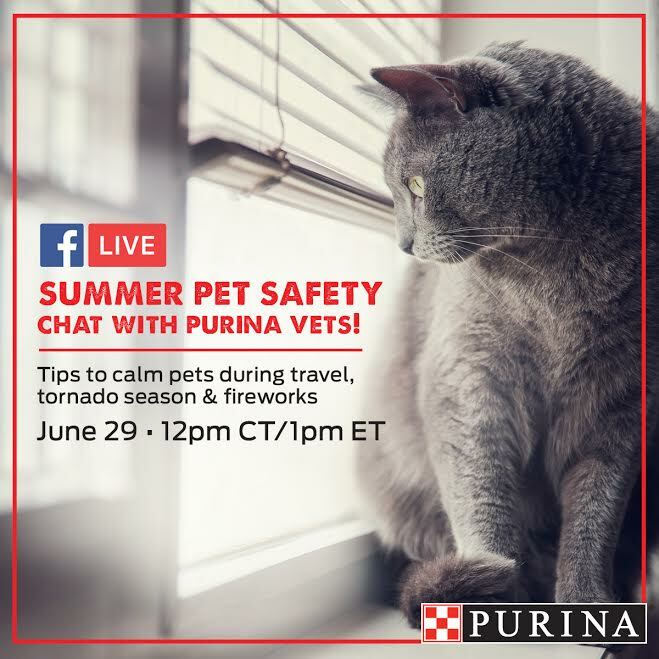 Join Purina and their veterinarian specialists on Facebook Live June 29, 2017 at 12PM CT, 1PM ET for a special discussion about calming pets during travel, tornado season, fireworks, and more. Both Nora and Truffles are especially anxious over the 4th of July holiday so I'm quite looking forward to attending! Now, tell me a little bit about the disasters you might need to prepare for in your area.